This was one of our books for Brit Lit and I'm so glad I was introduced to it. Sir Gawain is an interesting character that really adds to the King Arthur universe. It was originally written in Middle English so modern readers are reading it in translation but this is a particularly good one. It's very understandable and easy to read. The dialect it was written in originally did not become the standard English dialect so I imagine only scholars read it in the original language. Sir Gawain is at King Arthur's Christmas festivities when the Green Knight enters the building and proposes a game. He'll trade axe blow for axe blow with any knight in the room. When none volunteer and it appears that King Arthur himself will have to take up the challenge, Sir Gawain, the most celebrated knight in the court, jumps in to do it. If you don't know what happens when they play their little game, you've missed a fun story and I won't spoil it for you. 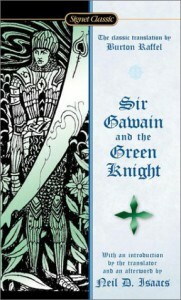 The rest of the book is Sir Gawain's quest to find the Green Knight again and all his adventures. It's great stuff! Sir Gawain and the Green Knight has a lot to say about the chivalric code, heroism, bravery and integrity. In the end, we find out who was behind the whole game (Arthur's evil half-sister Morgana la Faye) and Sir Gawain learns that he might not be everything he thinks he is. We end up with a humbled and chastened Sir Gawain who is proving the author's point about thinking more highly of yourself than you ought. Lovers of Arthurian legends probably shouldn't miss this. You can also see the beginnings of all the sword-play type fantasies that are being written. It's just a fun and clever piece of classic English writing. Don't let the fact that it came from the 14th century scare you off. You won't have any trouble with this translation.